To commemorate this year’s World No Tobacco Day, about 200 runners from different universities and communities recently gathered for a fun run in the Cuneta Astrodome in Pasay City to appeal to the Senators to pass the pending bills to raise tobacco tax. “We believe that World No Tobacco Day is the perfect avenue to campaign for the immediate passage of the tobacco tax bills filed in the senate. Today, we run away from the harms of smoking and actively campaign for better health conditions in the country,” said Austin Angeles from the Pamantasan ng Lungsod ng Maynila (PLM) and head of the fun run organizing committee of the Youth for Sin Tax Coalition. After an almost three-kilometer run, the young anti-smoking advocates from the Pamantasan ng Lungsod ng Maynila, Philippine Normal University, Polytechnic University of the Philippines, University of the Philippines and health advocates from different parts of Metro Manila, held a short program on the Senate grounds appealing to Senator Sonny Angara, chair of the Senate Committee on Ways and Means to conduct hearings on the pending bills of Sen. JV Ejercito and Sen. Manny Pacquiao. After the program, representatives of the runners talked to Sen. Ejercito inside the Senate building to give him a copy of the advocates’ statement. He said he supports the increase in tobacco tax rate, especially because revenues are needed to fund the universal health care (UHC) program. Meanwhile, in his speech at the forum, Health for Juan & Juana: Moving Forward with the Philippine Health Agenda held in Philippine International Convention Center on Tuesday, Ejercito expressed disappointment that a measly increase of PHP 2.50 in the excise tax imposed on cigarettes was included in the Tax Reform for Acceleration and Inclusion (TRAIN) law last year instead of his proposal to increase the tax rate by PHP 90 pesos per pack. Ejercito said significantly raising tobacco tax rates is key in fully implementing the UHC program, which he proposes to legislate. “The financing aspect could make or break the UHC as a landmark legislation. The biggest question that we should be asking now is where we are sourcing out the funds needed to finance UHC. This was the intention when I filed Senate Bill 1605 to increase the excise tax on tobacco products,” Ejercito explained. Aside from Ejercito’s Senate Bill 1605, Senate Bill 1599 by Sen. Manny Pacquiao also pushed the increase of excise tax on cigarettes to P60 per pack. “Our estimates show that we can raise at least P67 billion more if either of the current Senate Bills were passed. This is possible, as we have already seen how increases in tobacco and alcohol taxes had more than quadrupled the country’s health budget from P42 billion in 2012 to P171 billion in 2018,” said Jo-Ann Diosana, Fiscal Policy Reforms team head of Action for Economic Reforms (AER). 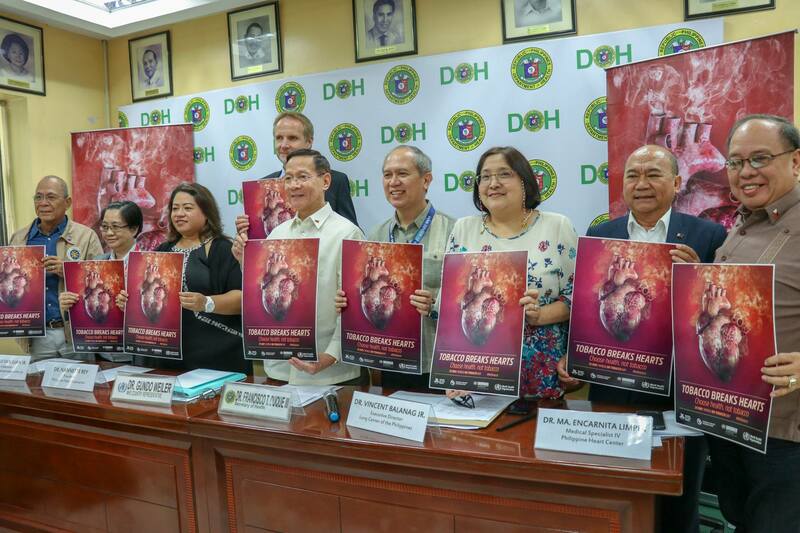 Every year, on May 31, World Health Organization and partners mark World No Tobacco Day (WNTD), with this year’s theme: “Tobacco Breaks Hearts”. The campaign focused on the impact of tobacco on the cardiovascular health of people worldwide. Globally, tobacco use and exposure to secondhand smoke contribute to approximately 12 percent of all heart disease deaths, as data from World Health Organization showed. “I would like to reiterate that tobacco use and breathing secondhand smoke may indeed break your heart. You may have heard of this, a million times, smoking is dangerous to your health, but we still want to remind you every time we have a chance. Tobacco smoke thickens the blood, increases the risk of blood clots, narrows the arteries and restricts oxygen in the blood,” said Health Secretary Francisco T. Duque III in a press statement. In the Philippines, one out of four adults still smoke. This puts them at risk of non-communicable diseases, including cardiovascular diseases like heart attack and stroke. Around four Filipinos die every hour from tobacco-related heart diseases. Also in the country, ischemic heart diseases or the “hardening of arteries” continue to be the leading cause of death with more than 74,000 cases recorded in 2016. Moreover, the Philippine Statistics Authority listed five other non-communicable diseases linked to smoking as top causes of deaths and diseases among Filipinos namely, cancer, stroke, hypertension, diabetes mellitus, other heart diseases. These are known to be strongly linked to four risks factors, one of which is tobacco use. The health chief further advised current smokers to quit smoking and seek help through phone-supported tobacco cessation called Quitline. Launched last year, Quitline (165-364) provides real-time counselling and support. “With the Quitline, Filipino smokers now have an easier, accessible way to put into action their intention to quit smoking,” said Duque. He also highlighted the importance of smoke-free environments that prevent smoking uptake among non-smokers and promotes quitting among current tobacco users and encouraged the youth to make informed decision and keep away from initiating tobacco use. “We call upon our youth to make informed decisions and make smart use of technology. With abundance of information available in the web, we hope everyone gets the right content from credible sources,” said Duque. According to the Tobacco Free Initiative’s Factsheet about health benefits of smoking cessation when an individual quits smoking, within 20 minutes his heart rate and blood pressure drops. Within 12 hours, the carbon monoxide level in the blood drops to normal and within a year, if the smoker ceases to use tobacco, his risk of coronary heart diseases reduces to about half compared to a current smoker. In five years, stroke risk is reduced to that of non-smoker.